Geoff Dyer is good on absence. In Out of Sheer Rage, he wrote a wonderful book about not writing a biography of DH Lawrence. In this new collection of pieces, he does it again: he writes so entertainingly about not seeing the Northern Lights that you’re glad he was deprived of the experience. Though you do feel a little sorry for his wife, who shared in “a lifetime of disappointment compressed into less than a week”. 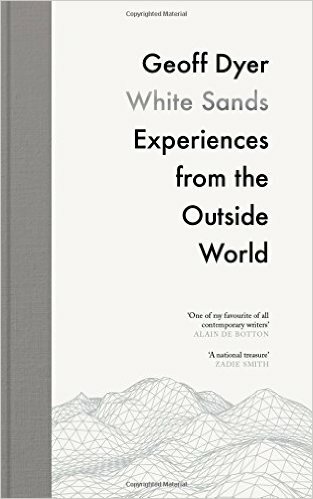 White Sands is billed by the publishers as “a creative exploration of why we travel”. It includes both non-fiction and fiction, though there’s no indication which is which. As the dedication is “For Rebecca”, Dyer’s wife, it’s probably reasonable to assume that a piece set in the Forbidden City in Beijing, in which Dyer gets the hots for his guide, is one of the fictional contributions. Another story, in which he and his wife pick up a hitch-hiker, is so full of bizarrely scary coincidences that it couldn’t be true — or could it? This is half the fun of reading Dyer, a writer who plays fast and loose with genre and category. This book, he says (80-plus pages in), is about “trying to work out what a certain place — a certain way of marking the landscape — means; what it’s trying to tells us; what we go to it for”. To mark the centenary of Gauguin’s death, he goes to the South Seas, to the islands most closely associated with the painter, which are now the most far removed from “the savage roots” Gauguin was seeking. If Hiva Oa were paradise, Dyer says, “then it was a paradise from which I was becoming impatient to be expelled”. Other outings are closer to his adopted home in California: to the former house, in Los Angeles, of Theodor (Teddy) Adorno, author of a seminal text in critical theory (“As a pilgrimage site it wasn’t exactly overrun with pilgrims. Just us.”); to two pieces of “land art”, Walter De Maria’s Lightning Field, in New Mexico, and Robert Smithson’s Spiral Jetty, in Utah; and to the Watts Towers, again in LA, made by one man out of concrete and leftovers, and which seem, like one of Gaudí’s buildings, to have erupted rather than been erected.